Finished in 1895 for William Waldorf Astor, to the elaborate architectural specifications of John Loughborough Pearson. 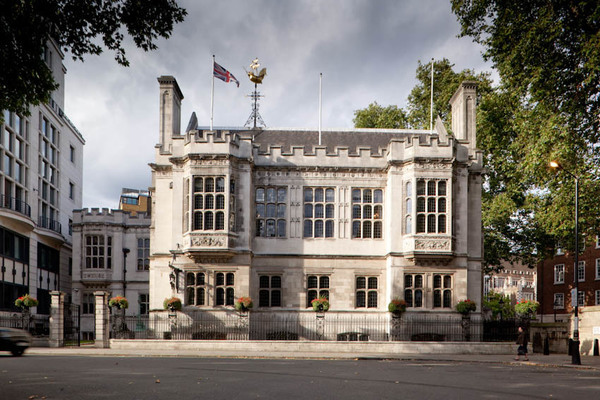 The building overlooks the River Thames and embodies the outstanding workmanship of the late Victorian period. 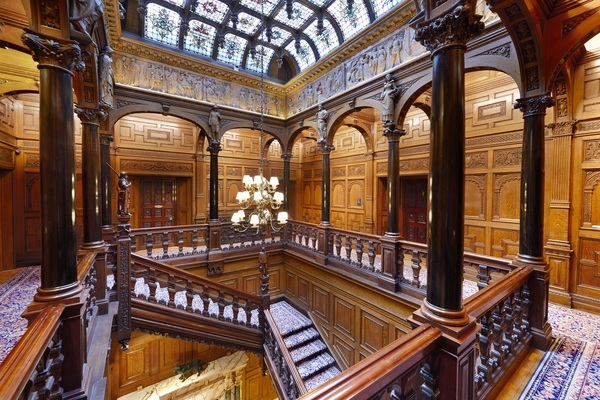 Two Temple Place was commissioned in the early 1890s by one of the richest men in the world, expatriate New Yorker William Waldorf Astor, to be his private estate office. Designed by the famous architect John Loughborough Pearson, it is an extraordinary celebration of late-Victorian design and craftsmanship. William was born in America in 1848, the only child of John Jacob Astor III and Charlotte Augusta Gibbes. When his father died in 1890, William inherited a personal fortune worth $100 million. He emigrated to Britain after repeated threats of kidnap, squabbles with his family and because he regarded America as ‘no fit place for a gentleman’. In 1893 William acquired the Cliveden Estate from the Duke of Westminster and blocked off the grounds from public access prompting the sobriquet, “Waldorf by name, walled-off by nature”. In 1903 he purchased Hever Castle, once the childhood home of Anne Boleyn. The gilded weather vane crafted by J. Starkie Gardner sails above the parapets – intended to be a representation of the caravel Santa Maria, in which Columbus discovered America. Before the front door stand two bronze lamp standards, decorated with androgynous putti who represented the marvels of electrical illumination and the latest technology - the telephone. 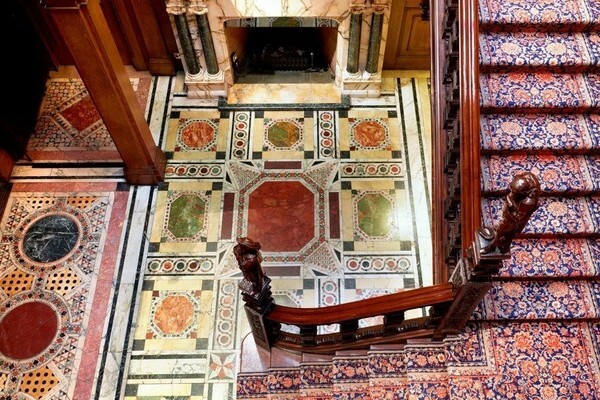 The floor of the Staircase hall is of inlaid marble in the Cosmati style, as seen at Westminster Abbey. The great oak staircase has newel posts topped by mahogany carved wood figures representing the chief characters from William Waldorf Astor’s favourite book – Alexandre Dumas’ The Three Musketeers: D’Artagnan, Madame Bonacieux, Aramis, Milady de Winter, Bazin, Athos and Porthos. The arcade surrounding the Gallery on the first floor has ten columns of irreplaceable solid ebony. On six of these stand carved characters from three great American authors: Uncas, the last Mohican and The Pathfinder from James Fenimore Cooper’s Leatherstocking Tales; Hester Prynne and Reverend Arthur Dimmesdale from Nathaniel Hawthorne’s Scarlet Letter; Rip van Winkle and his daughter Judith Gardenier from Washington Irving’s Knickerbocker Tales. Above these figures are four oak panel friezes in high relief by Thomas Nicholls, portraying memorable scenes from Shakespeare’s Henry VIII, Othello, Antony and Cleopatra and Macbeth. This was William Waldorf Astor’s private office, which VIP visitors entered through a massive carved-mahogany door. The inside of this door has nine decorative panels in silver-gilt by Sir George Frampton, depicting nine heroines of the Arthurian Legend in low relief. The hammer-beam ceiling is richly carved in Spanish mahogany and the wall panels are irreplaceable pencil-cedar. The gilded frieze includes 54 characters from history and romance, all chosen by Astor himself. Among them are Pocahontas, Machiavelli, Bismarck, Anne Boleyn and Marie Antoinette. Above this are twelve carved figures from Sir Walter Scott’s Ivanhoe, including Robin Hood, Maid Marian, Gurth, Wamba and Friar Tuck.